This afternoon my littlest one, who has been really sick, looks like death warmed up. Pale skin, deep black rings under her eyes and her trademark eye twinkle is missing. Yet, she refused to nap, every time her eyes would droop they'd suddenly snap open! She's so bloody tired and it's making me tired. I was just sitting here watching her line up her 'babies' on the lounge – a stuffed bird, a My Little Pony, a couple of dolls, a stuffed rabbit, a Barbie, Mrs Potato Head. 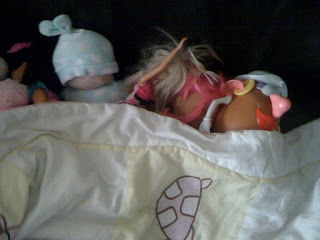 She draped a blanket over them all, kissed them and said: "Nigh night, my darlings. Sweet dreams." She then brushed her hands, plonked down next to me and looked up at me, her expression saying: "Phew, these kids, eh?" I'm just hoping they wake every hour shouting "Muuuuuuummmmmmmyyyyyy! I need you!" I feel your frustration - but boy, that's just so damned cute! Oh, poor little thing (and poor exhausted Mama too, I'm guessing). Ha ha! Love it - sorry, love reading about it but not actually loving the situation. Don't worry. She'll collapse in bed tonight and then, I'm guessing, so will you. Have been there before so feel your pain! Keep troopin'! bah ha ha!! My Miss 3 does that too, and I often crack up when I hear her rouse at them, "But it's bedtime NOW!!" I hope you both get some sleep soon.